Sure we've recently heard Nokia touting its impressive 260,000 smartphones sales per day rate, but despite boasting a healthy figure against the oncoming competition, it appears as though the iPhone is making some waves for itself in Europe. 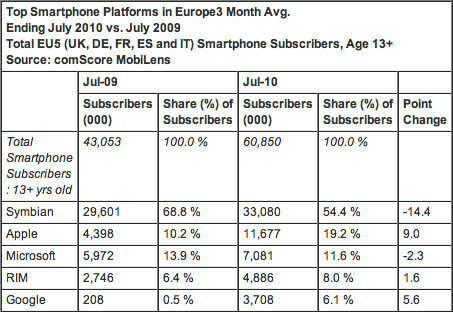 According to comScore, the iPhone now accounts for approximately a fifth of all the smartphones sold in Europe. Now the interesting part in all of this is that it almost doubled in a matter of a year to 19.2 percent as of July, but even more importantly, it appears as though it's doing some damage to Nokia. The Finnish manufacturer actually saw its numbers plunge from 65.6 percent from just a year ago all the way to 51.2 percent. Of course they're still the market leader it terms of share, but if this trend continues on the path it is, we could really start to see some shakeups across the big pond as consumers fully adopt Apple's iPhone handsets. 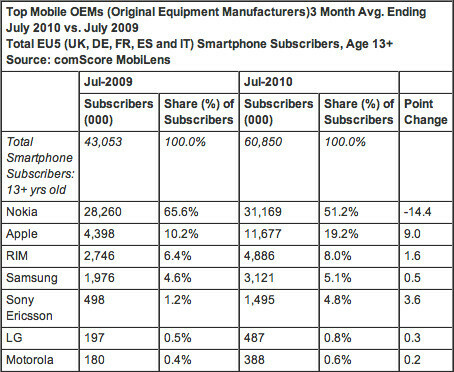 In addition, RIM saw an improvement as it managed to achieve a figure of 8 percent while Samsung inched its was to only 5.1 percent. Rounding things out, we see Sony Ericsson's decision to halt Windows Mobile based handsets in favor of Android and Symbian devices proving to be positive seeing that they quadrupled their share to 4.8 percent. Unfortunately for both LG and Motorola, they're having some difficulties in penetrating the European market as they both found themselves flat at less than one percent each. I'm not surprised. The iphone is truly a wonderful device, and a lot more people, even those who are resistant at first of the iphone, are now getting convinced that it's truly the best. Are you mad boy? You're asking loud to be flames to death, how you dare to talk positively about the iPhone when we all know that haters LOVE to get into articles about devices that they don't like just to insult and defend the products of companies that they are paying too. Doesn't matter. The iphone's track record speaks loudly for itself. Louder than any haters' comment can muster. Not even Consumer Reports can stop the success of the iphone4. The only thing that can stop the iPhone is... the iPhone itself. Arnold Schwarzenegger, Linda Hamilton, and Steve Jobs, in Terminator 5, iTerminate da competition. I'm one of those people that was recently convinced that the iPhone is the best. It took using an Android device to help me decide. I have the Droid and a iPod Touch (2nd Gen) and I know from having the iPod for 2 years and the Android for a few months which stands up the best and it's Apple. My Droid was the best there was till Google kept updating it till the OS is now garbage. It still has features, don't get me wrong, but they don't work well anymore. I will be getting an iPhone 4 very soon! Lets not ignore the fact that Nokia and Symbian's share is larger than all the other competitors on both charts....combined! Say what you will, but none of these competitors(especially apple with ios)will ever take down Nokia and Symbian. Ever is a big word you know that? This is because Nokia has been covering the international market alot longer than other developers. But you can see from the statistics in the article that Apple is gaining speed. And it seems that Nokia is slowing down. I'm not saying Nokia is bad, but you have to admit that Apple's products have great quality and actually WORK. Unlike Android, that gains your interest the first few months then takes a big crap after they upgrade the OS at breakneck speeds and makes the device work like junk...Apple works great till the hardware itself wears out. How can you say apple devices are so great and their latest handset cannot even hold a decent call without a bumper? Nokia will maintain it's lead as always. And with the new handset releases, Nokia will pick up again. Apple can't even beat out android, much less Nokia. Yes, and Nokia has a BIG lead on apple. And ilia, just because a few fanboys agree with you, does not mean you are correct. Even with you apple fanboys wishing on a star, apple will never surpass Nokia. And that is a fact. 260,000 new users a day can't all be wrong. By the way, that statement is SO wrong, since here in my country, my friend has the iPhone 4 and I tried it: it doesn't have those reception problems. Apparently, it's the carrier's fault in the USA or Europe. This is brilliant! It looks like I don't even need to argue on behalf of myself - unlike several months ago - there are now people who actually do it for me. Im Still trying to figure out why my iphone 3gs has so problems with Ios 4 :( Android is good Ios is better but Gingerbread I think will change all that.. I meant in a good way.. One thing to notice though is that Iphone firmwares are absolutely not compatible with the old Iphones..
Aside from 4.0 having problems with iPhone 3G - I am yet to hear that "iPhone firmwares are not compatible with the old iPhones". To this day the original iPhone - which was made back in 2007 still happily operates with 3.1.3. I have an iPhone 3GS and updated it to iOS 4.1 and don't have any problems with it. In fact, it's brilliant and works like a dream!!! When comparing Nokia or Symbian to Apple and its iOS, people are forgetting one thing: the iPhone has only ONE device and one device only: the iPhone!!!! whereas Nokia has dozens of Symbian OS phones not to mention other manufaturers using Symbian like Samsung.How can you even compare the sale of 10 or 20 phones against one???!!! besides, the Symbian and especially the touch, are all iOS wannabe but will never be. Even in the new Symbian ^3, they took the same coverflow so dear to Apple and pasted it into te OS.It'll be a miracle if Apple won't sue Nokia for that. Apple haters, it's time to make the tea.